Geographically, Baturraden located on the slopes of Mount Slamet. The main attraction is a mountain tour. Pine forest and lush resin at a height of 800 meters above sea level offers pure natural coolness. Coupled with traditional cultural and community life, the visitoru can for a moment forget the fatigue and the intricacies of big city life. 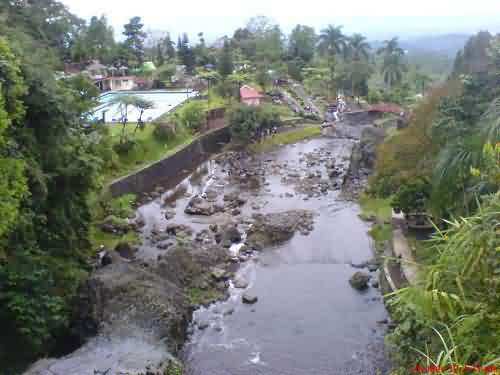 Baturraden actually consists of several tourist attractions. The biggest is Baturraden tour place. In that place, tourists can enjoy the unique natural scenery of mountains like a panoramic painting. Clear watershed of Gumawang river with cubistic cliffs is another attraction in the middle of Baturraden. Another interesting attraction is a 25 meters high waterfall. Visitors can see the attraction of the divers who jumped from the top of the waterfall into a natural pool beneath the waterfall by throwing a coin into the pond. The divers will immediately jump and scramble to get the coin. Visitors can also enjoy Lengger traditional dances and Calung music of Banyumasan in a stage. In addition, visitors can enjoy artificial attractions, such as swimming pools, zoo, chrysanthemum garden, botanical gardens, and a bath of warm water in Pancuran Telu. With the support of 108 hotels and inns, the tourism location covering 208 hectares are ready to receive thousands of visitors every time. 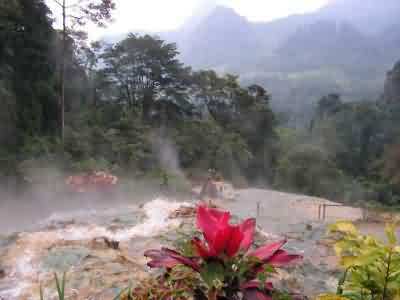 Long holiday at the end of the week is usually the most ideal time for enjoying the fresh mountain air in Baturraden. As a by-by, visitors can get typical food of Banyumas, like soto sokaraja, fried getuk sokaraja, soto jalan banks, mendoan, chips Sawangan, and jenang jaket mersi. To go to the location, visitors who don’t bring their own car can start from the Navan bus terminal. From this terminal, there are transportation tour colored in green ready to take visitors to the site. The travel as far as 14 kilometers can be reached in 45 minutes. Visitors who use private cars or party can take the path to the central city of Banyumas. From the town square, take the path to the north or Mount Slamet. Visitors can pass through the main patyhway or through alternative pathway in Baturraden Road West. Both can be passed comfortably because of the quality of smooth asphalt.